What will be on the November 8, 2016 Presidential General Mail Ballot? When will I receive my ballot? Ballots will be mailed to all active eligible voters the week of October 17-21,2016. 2. Place adequate postage on your ballot return envelope and mail it back. * October 17 - 21. 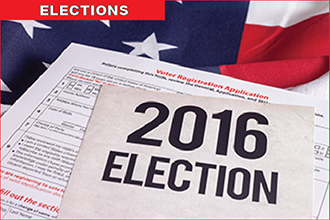 2016: Ballots will be mailed to all Active eligible electors. * November 1, 2016, Tuesday: Last day to file an absentee ballot application to receive the absentee ballot by mail if you are absent from your home address. * Kiowa County Clerk and Recorder's Office will be open on Saturday, November 5 from 8 a.m. to 12 p.m. for ballot drop off or replacement ballots. The Kiowa County Clerk and Recorder's Office can be reached at 438-5421 for voter, motor vehicle and election questions or recording information. You can also reach our office by email at delisa.weeks@state.co.us.